Cardbomb: Wishing you Warmth & Cheer! Do you every just fall in love with a set and you just think it is SO amazing and then it doesn't seem like you see very many people using it...? That's what's happened to me with the Warmth & Cheer set from the Holiday Catalog. I LOVE it!! I haven't had much time to play around with it yet but here's my first card with it. If you can believe it I've used six of the stamps from the set on this card!! I love the adorable little ornaments that come in this set and I can't wait to use them again! On this card I used them as background design and stamped them in Cucumber Crush ink on Cucumber Crush paper. I used the stitched stamp to create some background interest on the sides of my card and stamped that using Emerald Envy. The greens I used both go well with Real Red ink and Tempting Turquoise so I added the sentiment and fun, stitched/knitted heart in these colors. The Layering Circle Framelits were perfect to add some scalloped glimmer paper frames on top of some ruched ribbon and a Bermuda Bay banner. 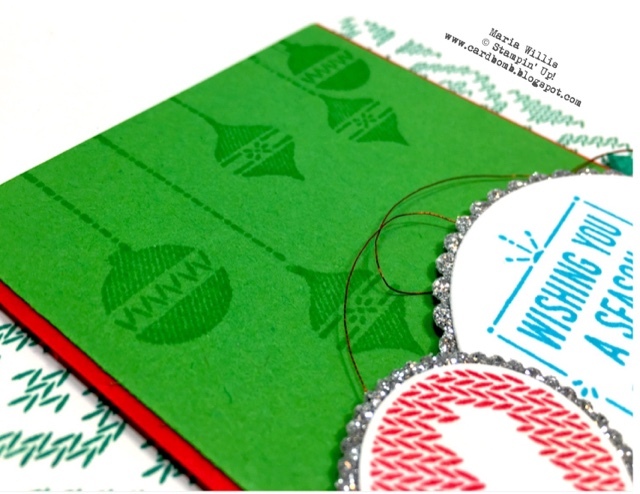 This card was so fun to make and even though it is full of stamping it was quick and easy too! I'll be back soon with more Warmth & Cheer fun!